With the right care, and a few simple steps, amaryllis bulbs rebloom year after year! Getting amaryllis to rebloom sounds difficult, but it’s actually really easy. Follow these step-by-step instructions to rebloom your amaryllis plants. 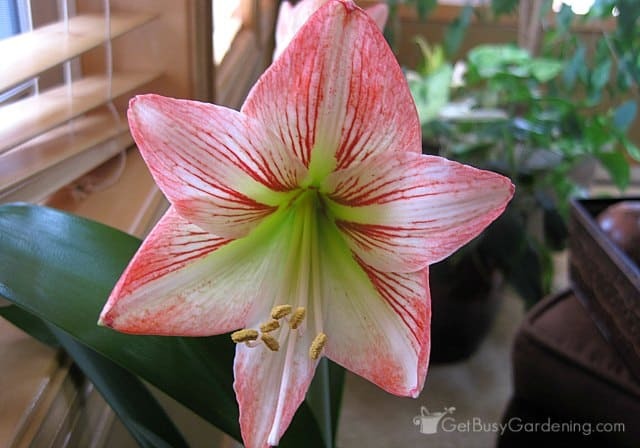 Amaryllis have become super popular winter blooming plants, and are especially popular during the holidays. But since they have the reputation of being disposable gift plants, many people toss their amaryllis out once it’s done blooming. This is really sad because not only do they make great houseplants, it’s also really easy to rebloom your amaryllis year after year. 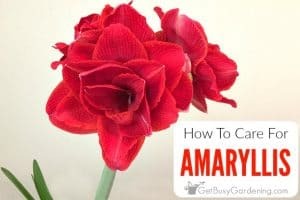 You just have to know the secret for how to make an amaryllis rebloom. Note: This method will not work with a waxed amaryllis bulb. Unfortunately, waxed amaryllis bulbs won’t bloom again, and will need to be discarded. Why Won’t My Amaryllis Bloom Again? The first time I bought myself an amaryllis plant, I thought that it would rebloom on it’s own every winter. So, after it was done blooming, I kept it growing as a houseplant, and it was one of my favorites. But, after a few years of growing it, my amaryllis never rebloomed, and I had no idea why. There were always tons of beautiful dark green amaryllis leaves, but no flower. 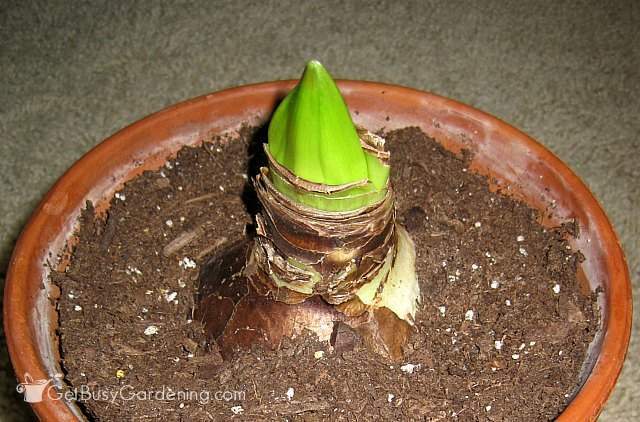 The crucial step for getting amaryllis to rebloom? Giving the bulb a rest period (i.e. : allowing it to go dormant). 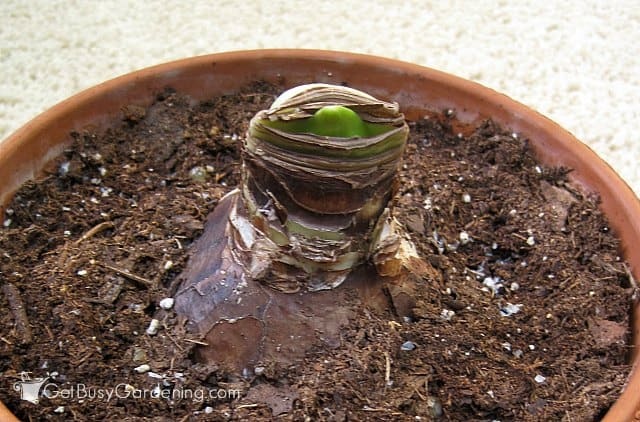 If you want to try to rebloom your amaryllis, you simply need to allow the bulb to go into a natural dormancy phase. Let it rest for a few weeks, and that will trigger it to bloom again. Once I figured that out, I have been able to rebloom my amaryllis plants every year, it’s super easy! And the funny thing is that amaryllis will flower so prolifically when they’re given the proper treatment that they can bloom even if the bulbs aren’t growing in dirt. Crazy, right!?! Step 1: Remove the flower spike – As soon as your amaryllis flowers fade and die, cut off the flower spike. It’s easy to figure out where to cut an amaryllis flower after it fades. Simply cut it all the way down to the top of the bulb. 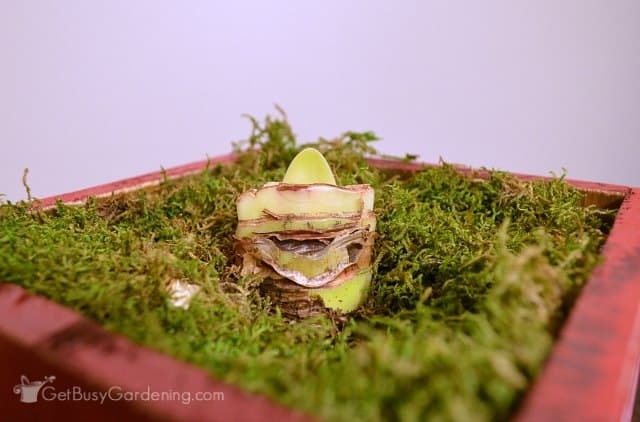 This step is important, because you want to make sure your amaryllis plant produces enough energy to store in the bulb so that it will be able to bloom again next year. Removing the faded flower and the flower stalk will allow the bulb to start building energy right away for next years bloom. Step 2: Keep the leaves growing – Grow your amaryllis as a houseplant through the winter, keeping it in a sunny location and leave the foliage growing. If you don’t have much natural light in your home, I suggest getting a grow light. Amaryllis make great houseplants, and have lovely thick green foliage. Step 3: Move it outside in the spring – Move your amaryllis plant outside to a sunny location once all chance of frost is gone in the spring. Just like any houseplant you move outside in the spring, you’ll want to slowly acclimate your amaryllis plant to full sunlight or the leaves could burn. Also, be sure it’s growing in a pot that has drainage holes so your plant won’t drown when it rains. Growing amaryllis outdoors during the summer is very easy, and you can practically ignore your plants all summer. Step 4: Fertilize your amaryllis – For best results, fertilize your amaryllis regularly during the spring and summer months. There isn’t a special kind of amaryllis plant food (at least not that I know of), so you can just use a general purpose one. I recommend using an organic fertilizer rather than a chemical one though, or you could risk damaging your plant (plus organic fertilizers work so much better!). My favorite types of organic plant fertilizers are fish emulsion (for outdoor use only), compost tea, or indoor plant food. It’s not essential to keep on a rigid fertilizing schedule, I’ve had success reblooming amaryllis bulbs even when I didn’t fertilize the plant at all. Just make sure you stop fertilizing a few weeks before you decide you want to move the plant indoors. 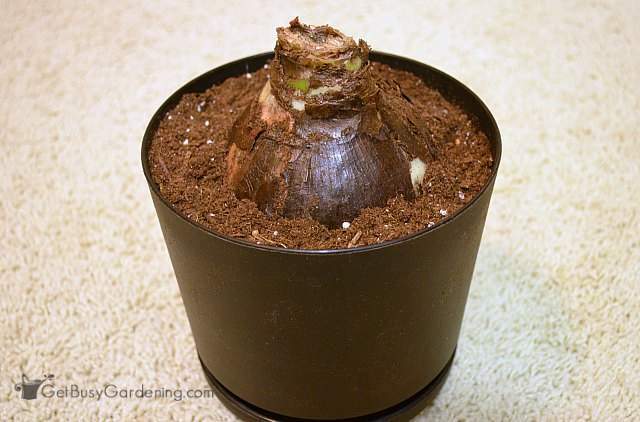 Step 5: Move the plant back indoors – I move my amaryllis plants indoors right before frost in the fall. If you want to rebloom your amaryllis for Christmas, then you’ll need to move it inside to start the dormancy period in about mid-August. 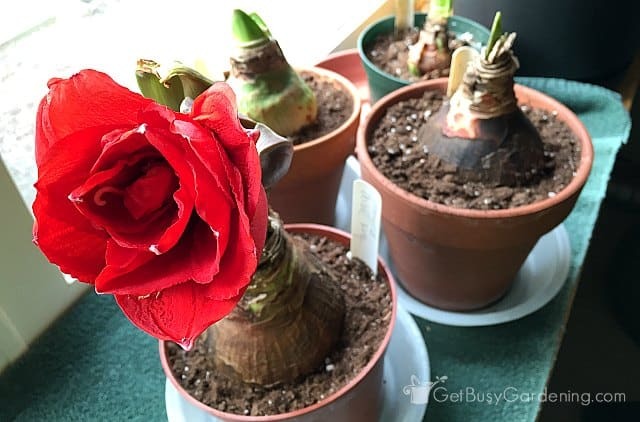 Step 6: Allow your amaryllis plant to go dormant – Here’s the crucial step to rebloom your amaryllis that I mentioned above (the one that I was missing for the first few years of growing amaryllis). Amaryllis bulbs need a rest period in order to bloom, so move your plant to a cool, dark location. Store your amaryllis dormant in an unheated basement or a garage where the temperature stays above freezing (never allow amaryllis flower bulbs to freeze). 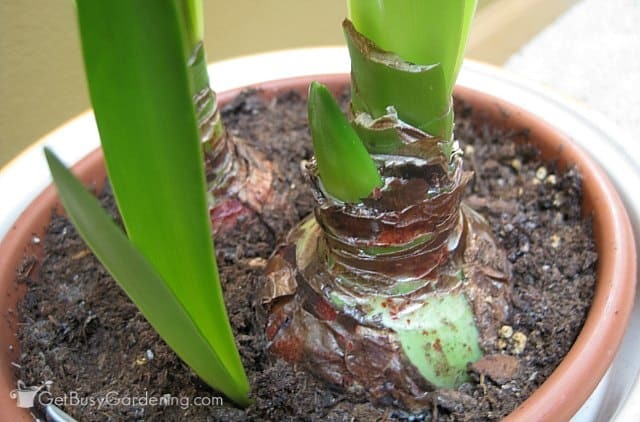 You can leave your amaryllis bulb right in the pot if you prefer, or you can store your bulbs bare root. I usually store mine in their pots because it’s one less step, but some people swear their amaryllis blooms better when they store the bulbs bare root. 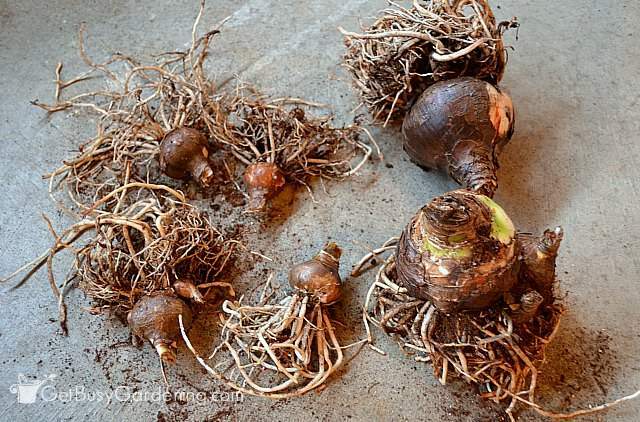 Step 7: Wait for 6-8 weeks – Store your amaryllis bulbs for 6-8 weeks. During this time, you’ll want to completely ignore them. 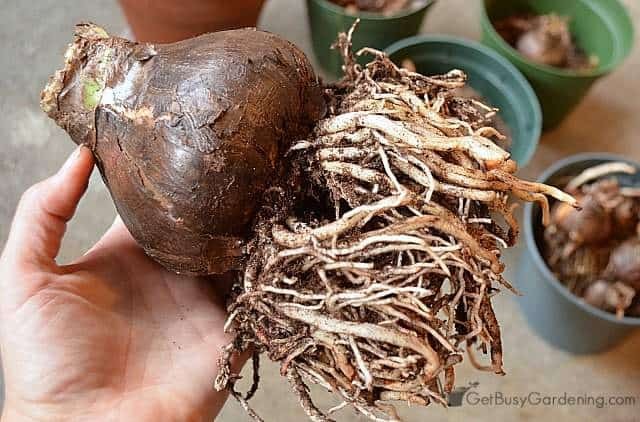 Allow the soil and the bulb to dry out completely, and don’t water your potted amaryllis at all while it’s in storage. The leaves will usually die back completely, so you can remove them as they dry up if you want, or just leave them be. 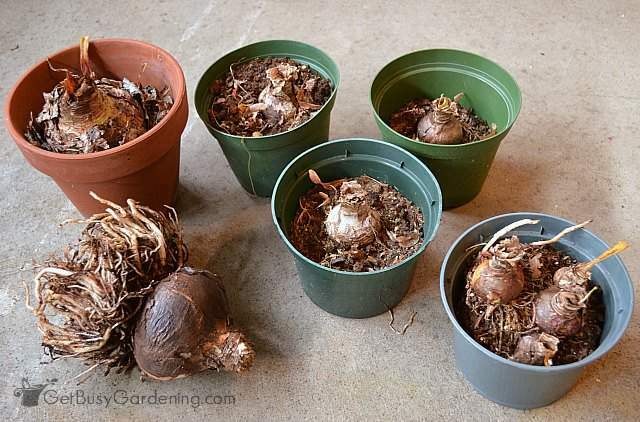 Step 8: Bring your amaryllis bulbs out of storage – If you stored your bulbs bare root, or your bulbs have outgrown their pots, then it’s time to repot them. You don’t need to worry about buying any special type of amaryllis potting soil, you can simply use a general purpose potting soil. When planting amaryllis bulbs in pots, take care not to bury them too deep, 1/2 to 1/3 of the bulb should be above the soil line. You also don’t want to use too large of a pot, it should be less than twice the diameter of the bulb. If you plan to leave your amaryllis flower bulbs growing in their current pot, then you can skip this step. Step 9: Break their dormancy – After their dormancy period is over, move your amaryllis bulbs into a warm, sunny spot, and give them a good drink of water. Adding bottom heat will help break their dormancy faster (you can use the same heat mat as you use for germinating seeds). Some amaryllis bulbs will start to grow within days of moving them to a sunny spot, others could take 4-6 weeks before showing signs of life. So be patient. It’s super exciting to see the first signs of life on your amaryllis bulbs after you break their dormancy! I’ve been reblooming amaryllis for years, and I still get giddy when I see them start to grow, especially when the flower spike starts to peek it’s head out. Keep in mind that sometimes the leaves will start to grow before the flower spike, and sometimes the flower spike will come first. You can tell the difference right away because the leaves will be flat and thin, and the flower spike will be thick and fat. 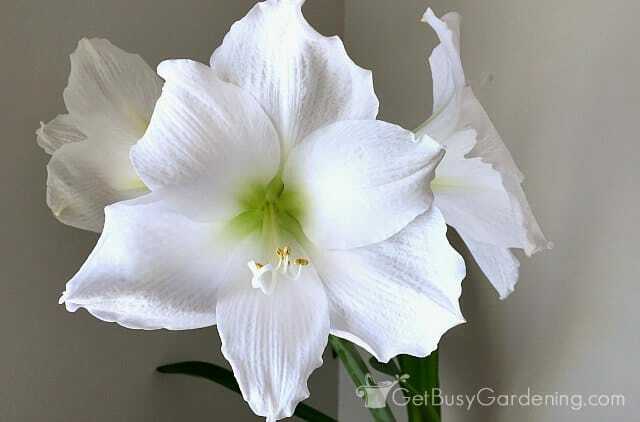 Don’t worry if your amaryllis starts growing leaves first, that doesn’t mean it won’t bloom. Also, depending on the age and size of your amaryllis bulbs, they might grow more than one flower spike. That’s always such a treat! As soon as your amaryllis starts to grow a flower spike, you’ll want to make sure it’s getting plenty of light. Amaryllis flowers grow really fast, and will reach for the light if they aren’t getting enough. They can also grow really tall and skinny if they don’t get enough light, which makes the stems weak, and they might not be able to support the weight of the flower. So, add a grow light if you need to, and make sure to rotate the pot daily so the flower spike will grow straight up. If the flower spike won’t stand up by itself, you can use an amaryllis stake to hold it up. 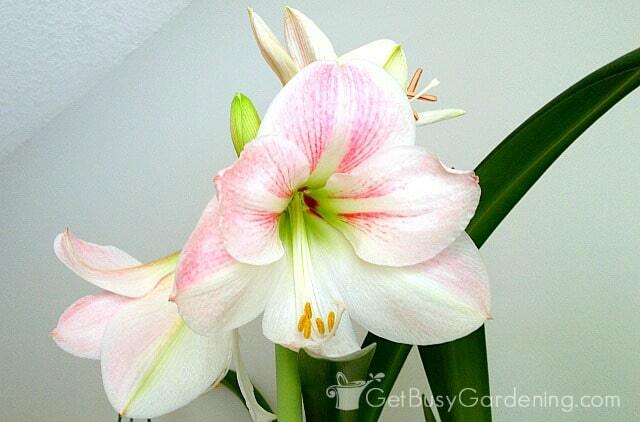 Get my complete amaryllis plant care instructions here. 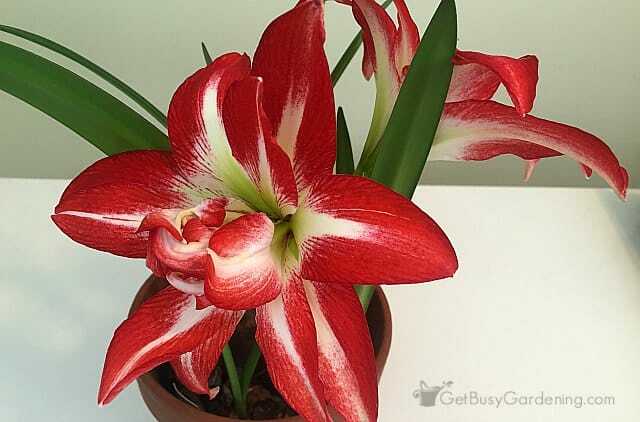 Amaryllis plants are very easy to care for, and make wonderful houseplants. If you follow these steps for how to rebloom amaryllis bulbs, you’ll be able to enjoy those gorgeous flowers for years to come! 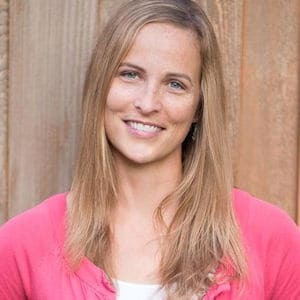 It will even produce babies as it get older, which can be removed and potted on their own, though it will take a few years before these babies will have blooms of their own. If you don’t have any of these gorgeous plants in your collection yet, you can buy amaryllis bulbs, or find amaryllis plants for sale around the holidays. If you’re a bargain hunter (and have patience), you can find tons of discount amaryllis bulbs on sale after the holidays (and this is why I have so many in my collection!). 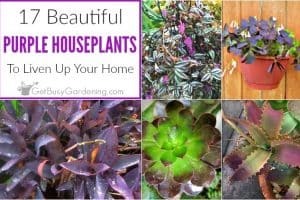 Want more information about caring for different types of houseplants (including other fun winter blooming plants)? Pick up a copy of my Winter Houseplant Care eBook! 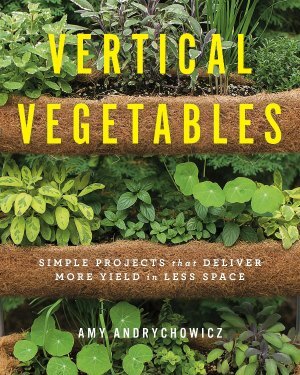 It’s filled with tons of information about keeping houseplants alive (and thriving!) during the long winter months. 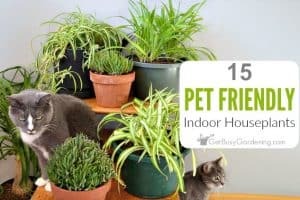 It will make growing houseplants a joy again! Do you rebloom your amaryllis plants every year? 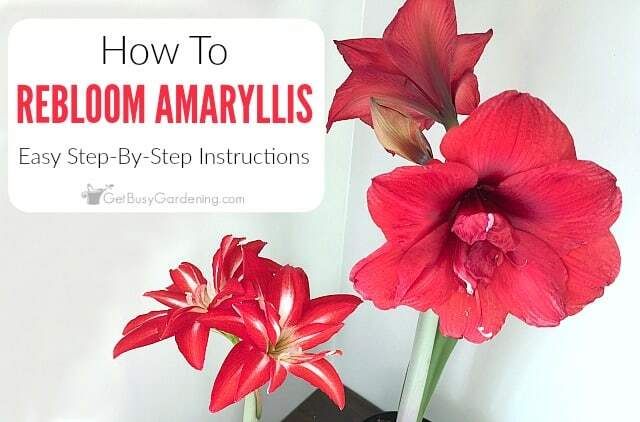 Share your tips for how to make amaryllis bloom again in the comments section below. Great post! I like the "time lapse" photos. Great way to capture the plant growth. Congrats on the Amaryllis bloom! Hi PlantPostings – thanks! I'm glad you like the "time lapse" slideshow. I love modern technology! 🙂 It was fun to see them grow and bloom. Thank you for the info, I have a amaryllis plant and excited to see it flower for the first time. This was very helpful it showed me how to take care of my plant. The leaves are so tall in my pot and I brought it indoors on a sunny porch and can’t wait for it to bloom. Never bloomed hoping it will because I have tall leaves. Don’t forget that you need to let it go dormant in a cool, dark location in order for it to bloom. Good luck! I forgot the step of moving the amaryllis bulb outside. Is that Ok? Will my plant bloom again? It was been inside since the spring. I just moved it into my cold cellar in hopes that it will bloom again this year. It could still rebloom as long as it got enough light over the summer. So, if you had your amaryllis plant in a sunny window, or growing under lights. But, even if it wasn’t, you never know so it’s totally worth the try! 🙂 Good luck! I bought a packaged amaryllis that had a (completely white) leaf and flower in the box. Is there a way to recover it? Was it white because of lack of light? If so, then I would imagine that you could pot up the amaryllis and put it near a sunny window and it will start to get it’s color back pretty quickly. I’m not sure if it will fully recover before the bloom fades though. Just be sure to keep the foliage growing in plenty of light so that the amaryllis bulb can regenerate enough energy to rebloom again next year. Great advice! Just curious, why won’t the waxed bulbs re-bloom? I purchased 4 yesterday, cut the dead stems, removed wax and re-potted. They have little nubs for roots. 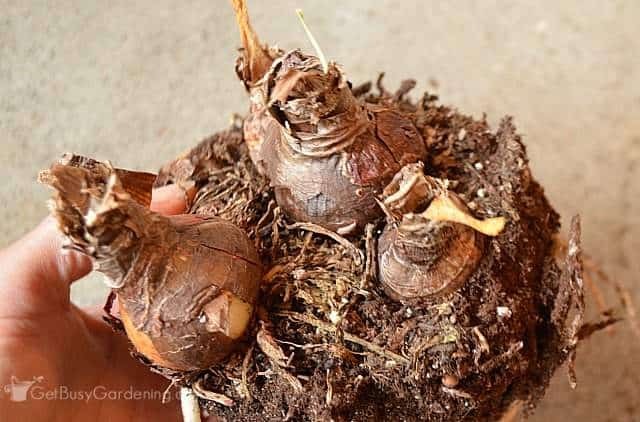 Since waxed amaryllis bulbs are sold as disposable plants, growers usually cut off all the roots before dipping the bulb in wax, which is why you usually can’t rebloom them. 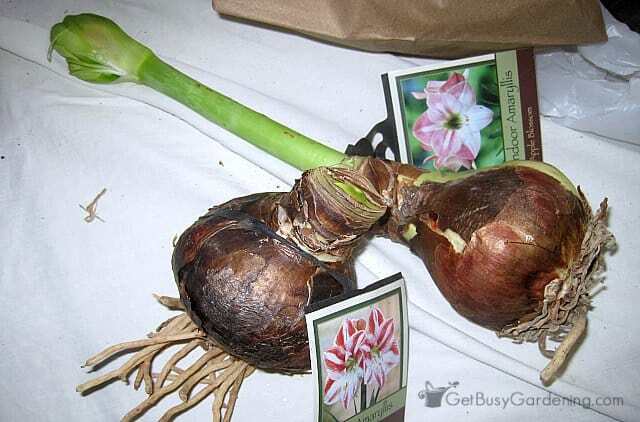 But if your amaryllis bulbs have healthy roots growing, then I say go for it. Fun experiment, and you have nothing to lose! 🙂 I’d love to hear if they end up surviving for you. I have two bulbs that I started at Thanksgiving. One was from last year and was kept dormant until then. Neither the new bulb or the old bulb has produced flowers just green leaves that are over two foot tall. Is this normal? Do I just keep them till leaves die and try again next year? Sometimes amaryllis bulbs will grow leaves before they grow flowers, so you might still be surprised by flowers this year. 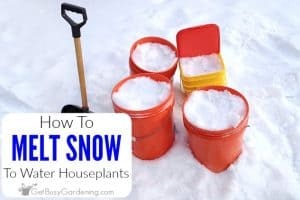 But, if they don’t end up blooming then yes, keep them growing through the summer, and follow the directions in this post to get them to rebloom for next year. Good luck! Yes never know. They still have the growing leaves and maybe bloom again. And the roots are growing again. I will try to plant them in soil and see how it turns out. I will keep you posted. Thanks again. Good luck! I hope they’ll grow and rebloom for you. I grew my amaryllis outside when I lived in Florida and they returned every year with no assistance from me. However, we moved to Tennessee 3 years ago and I got a beautiful amaryllis for the holidays. It remains in my kitchen, the leaves died and it went dormant. It is May 17 and it is growing leaves and sprouting again!!!!! Twice in the same year!!!! Yes, amaryllis can easily be grown in the garden in warm climates! So excited your dormant amaryllis is starting to grow again. I hope it will flower for you! I did not know waxed amaryllis was a disposable thing. So, when they (I had 2 pots/plants bought from Trader Joe’s) stopped blooming and looked like dead, I investigated the bulbs, found out they were alive , and I could not through out live plants. I unwaxed them and planted them into regular soil. They took off happily. But now, several months later, each of them have 2 leaves over 2 feet each and nothing else. There’s nothing visible in between the leaves at all. Is there something else to do to change the way they develop? I have no garden, just tiny pretty dark apartment. What would you suggest? I live in Phoenix, AZ and when I put my plant outside it started to die from the heat. I brought it inside and it is doing great.Now I’m wondering do you cut the leaves off to put it in a dormant state and should I wait until it gets cooler here? My garage is still very hot and I have no basement. If I put it in a paper bag and put it in a closet, will that be enough? Or should I wait until it is cooler here and then try to have it bloom later, like in the spring? Thanks for any help. Followed the steps and now have two tall leaves but no bud stem appears. Sometimes the leaves can start growing before the flower spikes will appear. Give it time, and hopefully your amaryllis will bloom! If it doesn’t flower this year, then try fertilizing it next summer and see if that does the trick for getting it to rebloom next year. Enjoy! Great post and information, thanks! Just wondering if the wax is obvious, as I tossed the packaging and want to try to keep the bulbs. If it’s a waxed bulb I may just be wasting my time. Yes, the wax is very obvious. Many times it’s colored or decorated for the holiday season too. If you had a waxed amaryllis bulb, the entire bulb would be encased in a thick layer of wax. my amaryllis bloomed beautifully indoors during cold months. I cut the bloom stalks off and now it has grown these long leaves. It’s April now and I haven’t watered it since it bloomed. It’s still in its pot. What do I do now to get it to bloom again this winter. Not sure what to do with those long leaves. Your amaryllis won’t bloom again this year, it needs a period of rest in order to bloom again next year. Follow the instructions above in the article to learn exactly what you need to do.